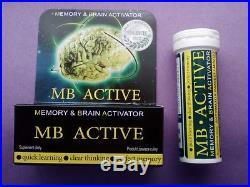 Memory & Brain Activator. Helps increase alertness, focus and concentration. 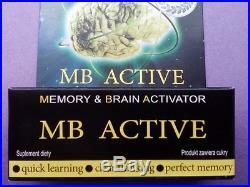 Supports the cerebral circulation and cognitive processes. Assists in the maintenance of normal mental capacity. The ingredients contained in the product have the following effects. CANNABIS SEEDS OIL – Hemp seeds contain all the essential amino acids and fatty acids, necessary for the proper functioning of the body and maintain health. For this reason, over thousands of years have been valued nutritional product. Hemp seed oil is an extremely rich source of linoleic acid, which is necessary for the proper functioning of the brain. Hemp seed oil acts anti-stress and very positive effect on well-being. TAURINE – is an amino acid present, among others, in the central nervous system, which helps stabilize the cell membranes of the brain, stimulates and regenerates brain cells and protects them from oxidative stress. It has the effect of improving memory. According to some data enhances the effects of caffeine and other stimulants. Taurine significantly increases the physical capacity of the body, counteracts the aging, since it complements the deficiency, so important for the human body, endogenous amino acid. GINKGO BILOBA extract contains bioflavonoids, which dilate blood vessels and improve the supply of tissues with oxygen. It improves peripheral circulation and increasing cerebral blood flow. 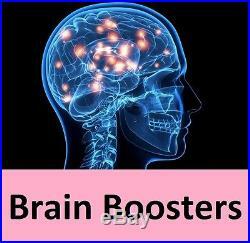 Improves memory, helps concentration and increases mental and physical performance. It has strong antioxidant activity, thus protecting blood vessels from atherosclerosis and slows down the aging process. CAFFEINE – is an alkaloid, which thanks to the easy penetration of the blood – brain barrier, stimulates the central nervous system. Many studies have confirmed that caffeine increases the ability to focus attention, which leads to better concentration of thought processes and to extend the period of its duration. It helps combat drowsiness. It is used in states of physical and mental exhaustion. The high content (60 mg in 1 tablet) of caffeine – equivalent to 1 cup of coffee. L-Tyrosine – is an amino acid involved in the formation of neurotransmitters conductive pulses from the nervous system to the brain and muscles. Thanks to these properties, a beneficial effect on mood and memory capacity of the brain, increases the speed and clarity of thinking and long-term memory. Tyrosine also supports an important process of obtaining energy from adipose tissue. Used as a dietary supplement supplements arising during exercise, deficiency of endogenous tyrosine, which also allows for a long period of time to maintain physical and intellectual activity at a sufficiently high level. Oil of sage – is valued as a means of improving memory and sharpen the senses. Clinical studies conducted recently in the United Kingdom in the Medicinal Plant Research Centre at the Universities of Newcastle and Northumbria, clearly demonstrated a significant improvement in memory in healthy young people with daily administration (5mcl) essential oil of sage. Memory & Brain Active increases the speed of learning and improves the clarity of thinking, sharpens the senses, improves memory and logical thinking, and significantly improving the well-being. Content of components characterizing the product at the recommended daily dosage in mg. Hemp seed oil (9.2). Peppermint oil (8.3). Dry extract of ginkgo biloba (6). Oil of sage (4.3%). Tocopherol – vitamin E (2.4 mg equivalent of alpha-tocopherol – 20%). Iron (2.1 15%). Long Expiry date: 03.2020. Usage: The tablets should be swallowed no more than 1 to 2 hours. Do not exceed 3 tablets a day. Net Weight: 16 g. The product is designed for people who work mentally, during the hard intellectual work, for people that would like to stay mentally sharp and focused. Taurine; lactose; saccharose; media – sorbitol; glucose; caffeine; dry extract of ginkgo biloba; silicon dioxide; L-zinc aspartate; gluconate, iron (II); maltodextrin; L-tyrosine; hemp oil; oil of sage; peppermint oil; L-ascorbic acid; calcium pantothenate; tocopherol. Warnings: The product is not recommended for young children, pregnant women and breast feeding, and for people who are allergic to the ingredients. If you are taking anticoagulants or inhibit platelet aggregation, before consuming the product due to consult a doctor. Products will be pulled out of the box and inserted in the envelope. The item “NEW Ginkgo Biloba CANNABIS Hemp OIL Memory Mind tablets Brain Boosters Pills” is in sale since Wednesday, June 13, 2018. This item is in the category “Health & Beauty\Natural & Alternative Remedies\Other Natural Remedies”. The seller is “memory-10″ and is located in Hereford. This item can be shipped worldwide.